This word is taken from a potion in Greek mysticism that is said to have made the person who consumes the enchanted beverage to completely forget their worries. This is what designer Dan Corson named his streetlight installations, and they are giving ordinary streetlamps a conscious. The name also comes from a type of carnivorous plant which although striking, it is unusual too. 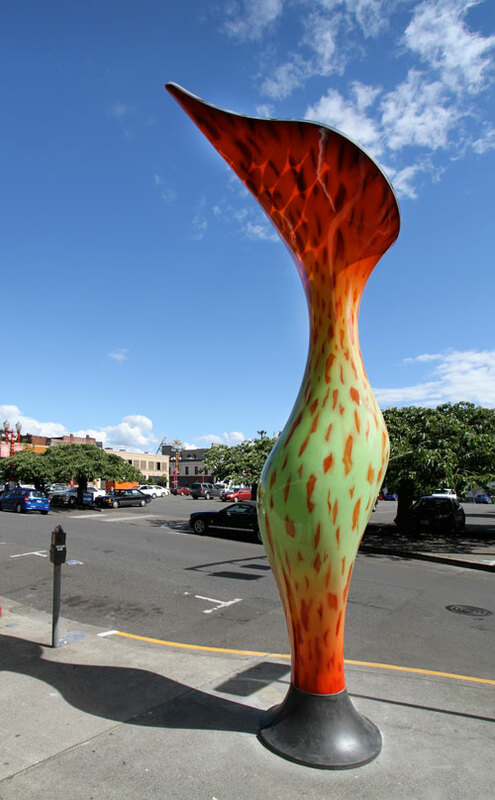 Nepenthes are a tropical variety that are referred to as pitcher plants due to their distinctive shape, which Corson stated inspired the model of the design. They have cups that gather rainwater and collect insects, which are then dissolved by enzymes in the plant. This creates a natural fertilizer to help feed the plant, which often grows in barren conditions. 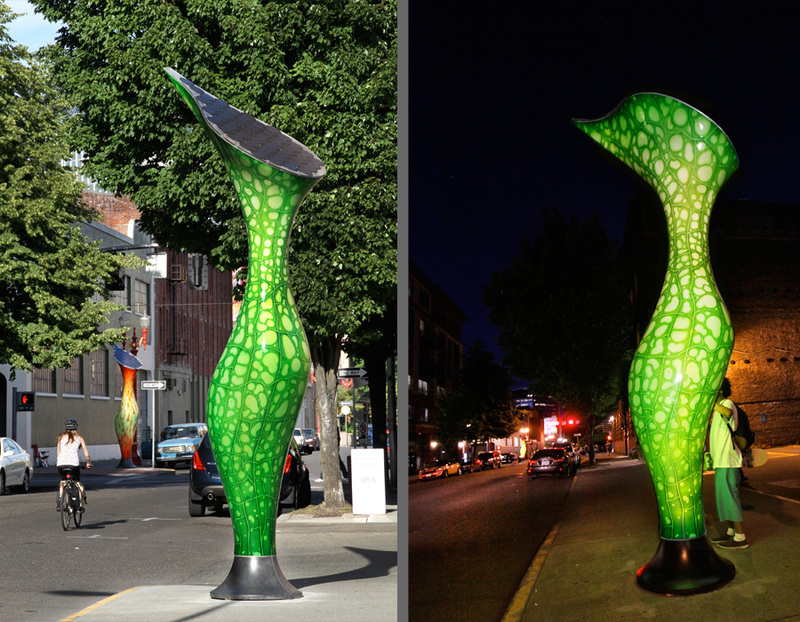 Constructed of steel and fiberglass, the pieces also function as efficient decorative street luminaries. LED lighting, solar cells and battery backups are embedded within the lamps. About an hour after the sun sets the lights will begin to emit a glow and will stay brightened for approximately 4 hours. Designed with the hustle of the everyday in mind and that daily grind business often makes its way into the streets at some point, his structures are meant to stand out in their Portland, Oregon neighborhood. He stated that his intention was to offer a moment away from it all, even if only for a few visually heightened seconds of peaceful distraction. Initially started as a town venture aided by project assistants and the local arts and cultural council, the lamps were actually supposed to be city markers. Residents who wanted to add a little extra to the concrete surroundings asked that they liven up the design. 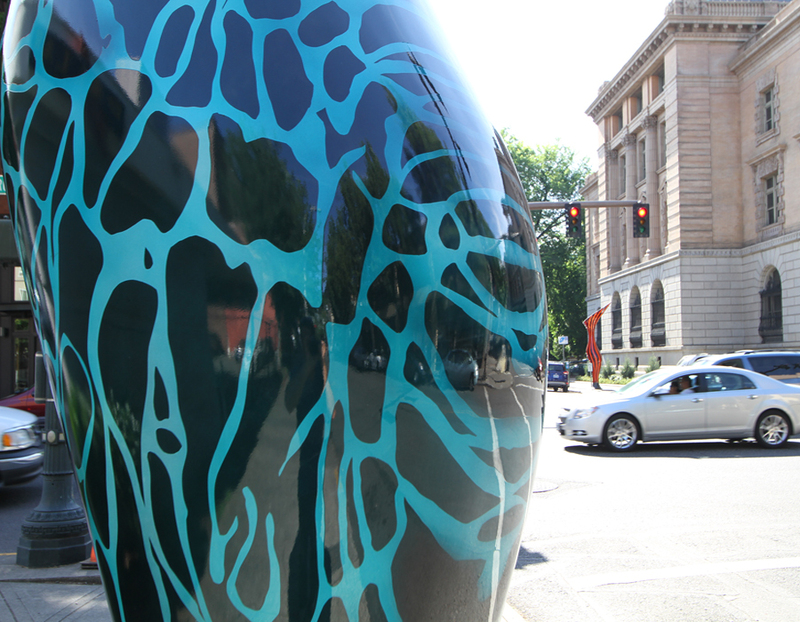 Corson listened to the appeal, and his creations certainly energized the local streets. These cheerful solar installations are reminders that utility does not have to sacrifice visual delight.